To make the criolla sauce, julienne the onion, add the lime juice and ají chopped into small slices or pieces. Heat the oven and warm the bread. Once warmed, cut the breads in half horizontally without separating the two sides. Spread the mayo, mustard and ground ají (optional). Add the lettuce and ham then cover in criolla sauce. If you can't find ají, you can use another type of pepper like serrano. 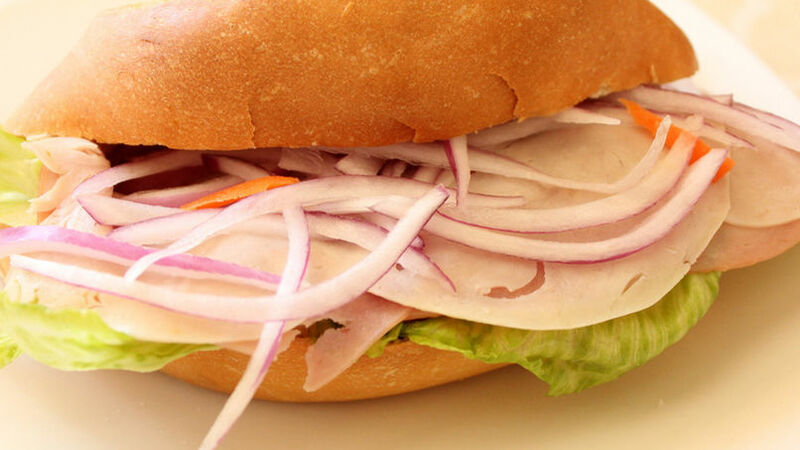 The butifarra is a traditional Peruvian sandwich made with local ham called jamón del país. It's made by cooking a boned hind leg of pork with a mixture of ingredients like pepper, garlic, achiote and cumin. Since I live in California, I don't have easy access to this kind of ham, so I used turkey ham to create these delicious butifarras. I hope you like it as much as I do and prepare if for your next summer picnic.